This block is for Linda. She sent us the fabrics and said “It’s a simple 16″ block called Philadelphia Pavements. 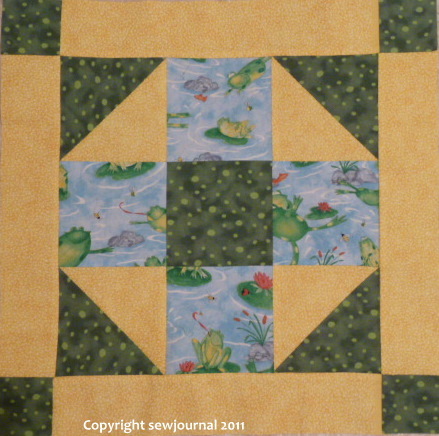 I will be making three 32 inch square little quilts from the blocks for our Loving Hands group at my guild (they always seem to come up short in the boy department). These little quilts are given to the local hospital’s NICU to use on the isolettes. They drape them over the top to help block out some of the glaring lights that are necessary in that unit. The quilts then are used by the parents and the baby and are given to the family to keep. I think it is such a great way to add a little fun and color to an otherwise scary and traumatic place. ” What a great cause! I like that block. I think it will be perfect for a tiny little boy. You are right about there being a scarcity of things for boys. Everyone caters to girls with the colors and prints, but boys are mostly left out. What a wonderful organization you belong to!